This 12" came bundled with the limited fancy version of Beat The Champ. It contains two songs not on the full album; "Blood Capsules" and "Dub Capsules." 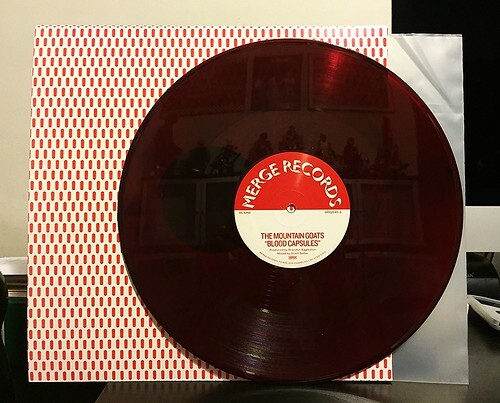 It's also on blood red vinyl, which is a nice touch. "Blood Capsules" carries over the basic theme of Beat The Champ, spinning yarns about pro wrestling. This particular song tackles the plight of the down on his luck wrestler trying to pay the bills. "But there just isn't any money on the independent scene" as one line goes. The story is told over a mid tempo bouncy guitar riff. It comes off a little lighter than some of the other album tracks, but that's not a slight at all. It's a fantastic song. The B-side is a re-working of the song into "Dub Capsules." I don't think I can really judge this fairly. I'm not a fan of dub and have a hard time telling the good from the bad. It's pretty unrecognizable from the original version aside from a few snippets of lyrics woven through the track. I would have preferred another album outtake (assuming there were any), but as this was not something I had buy on it's own, it's hard to get bent out of shape over it. Plus the A-side is great, so that helps.